Nerf gunners in Singapore, get ready your guns. There will be an open match on 29 and 30 August 2009 at Downtown East D'Marquee from 9am to 830pm. 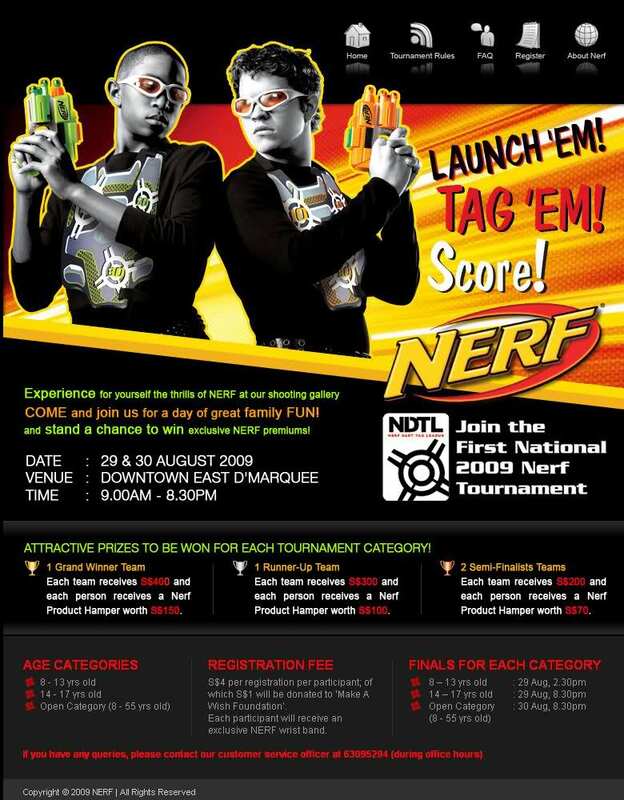 This is the first National Nerf Tournament in Singapore. Gather 4 players and form a team to register at http://www.nerf2009.com.sg/nerf09/. Part of the registration fees will be given to charity too. Don't worry if you do not have a Nerf gun, all blasters and equipment are supplied by the tournament organizer. Just register and play! Thank SGNerf for the info. So are you joining with your customized Nerf pistol? Willie Im sure there will be more in time to come. Any nerf players over at your end?